Results: Solving a jigsaw puzzle can be complex, but as pieces are put together, a complete picture emerges. Atmospheric scientists at Pacific Northwest National Laboratory are adding pieces to the climate change puzzle by studying Arctic mixed-phase clouds. Their research, published in the Journal of Geophysical Research Atmospheres, includes results for better representation of Arctic clouds in global climate models. Why it matters: In many ways, what happens in the Arctic does not stay in the Arctic. Atmospheric scientists consider this region a barometer for climate change, as a warming Arctic can affect people around the world with rising sea levels, shifting ocean currents, and changing weather circulation patterns. Clouds impact Arctic climate through rain and snow, by reflecting solar radiation and by affecting air and surface temperatures. 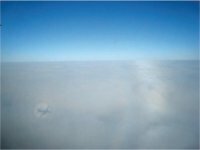 A better understanding of Arctic mixed-phase clouds, in which both liquid and ice particles often form in a churning system of updrafts and downdrafts, leads to a better picture of clouds in global climate models, improving the accuracy of climate projections. Developing a more comprehensive understanding of climate change will help policy-makers with decisions on how to delay or adapt to climate changes. "Current global climate models have failed to predict the rapid Arctic warming, and clouds are one of the largest uncertainties. So, it is very important to more accurately represent these clouds in climate models," said Dr. Jiwen Fan, a PNNL atmospheric scientist who led the research team. Methods: To better simulate Arctic and global climate change, it is essential to understand Arctic cloud physics, including how clouds form and are maintained in a mixed-phase state. Unfortunately, many of these cloud properties must be estimated through parameterization, a technique used to represent complex small-scale systems, because climate model resolution is too coarse to resolve small-scale cloud features. Using a three-dimensional cloud-resolving model with explicit representations of cloud physics, scientists simulated single- and multi-layer mixed-phase clouds observed in previous field studies. "Probability density function," a statistical representation of the likelihood of something occurring at any point in time, was used to examine cloud properties, including vertical motion, liquid and ice water content, and the conditions of cloud particle growth, including how ice crystals grow at the expense of liquid droplets. They also studied how liquid and ice particles mix and co-exist in updrafts and downdrafts. The research team learned that the process of ice growth at the expense of liquid evaporation occurs in about half of mixed-phase regimes, primarily in downdrafts. In the remainder, both liquid and ice grow simultaneously. In examining the probability distributions of liquid and ice water contents and vertical air velocity, the researchers found the ice-water mix changes at different cloud layers and with cloud development. Therefore, in climate models, those distributions are recommended to be predicted, not set as fixed values. Researchers offered other suggestions for improving cloud representations in global climate models. What's next: Using the new insights about cloud properties gained from this study, researchers will introduce improved elements into the Community Atmosphere Model to better understand Arctic climate change. Acknowledgments: This study was supported by the U. S. Department of Energy, Office of Science Climate Change Modeling Program and Atmospheric Systems Research program. The research was performed by Drs. Jiwen Fan, Steven J. Ghan, Mikhail Ovchinnikov, Xiaohong Liu, Philip J. Rasch of PNNL and Dr. Alexei Korolev of Environment Canada. Reference: Fan J, S Ghan, M Ovchinnikov, X Liu, P Rasch, and A Korolev. 2011. "Representation of Arctic Mixed-Phase Clouds and the Wegener-Bergeron-Findeisen Process in Climate Models - Perspectives from a Cloud-Resolving Study." Journal of Geophysical Research, 116, D00T07. DOI:10.1029/2010JD015375.